Born in Stratford upon Avon, Ros received a BA hon’s degree in ceramics from the university of Wolverhampton in 1999. She has exhibited throughout Europe, Dubai and California. At present she is showing in a number of galleries in Germany. Ros has taught in many schools in the Midlands as a visiting artist in residence creating permanent ceramic installations and recycled art projects . One of her children’s projects was on display at the National Gallery in 2014 as part of the ‘Take one picture’ initiative. Working from her studio in Alderminster she creates her memorable aquatic creatures combining brightly glazed porcelain and reclaimed domestic objects. 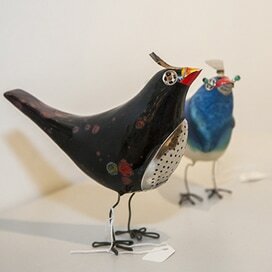 Ros undertakes commissions and runs adult ceramic workshops on a regular basis .